OLYMPIC WATERGUARD Semi-Transparent Wood Stain + Sealer has been specially designed to provide complete outdoor protection for your wood. A rich colour allows the natural wood grain and texture to show for an enhanced beauty. Ideal for deck, fences, outdoor furniture, railings and siding. Available in 3 ready-mix colours. One coat is sufficient for maximum protection. 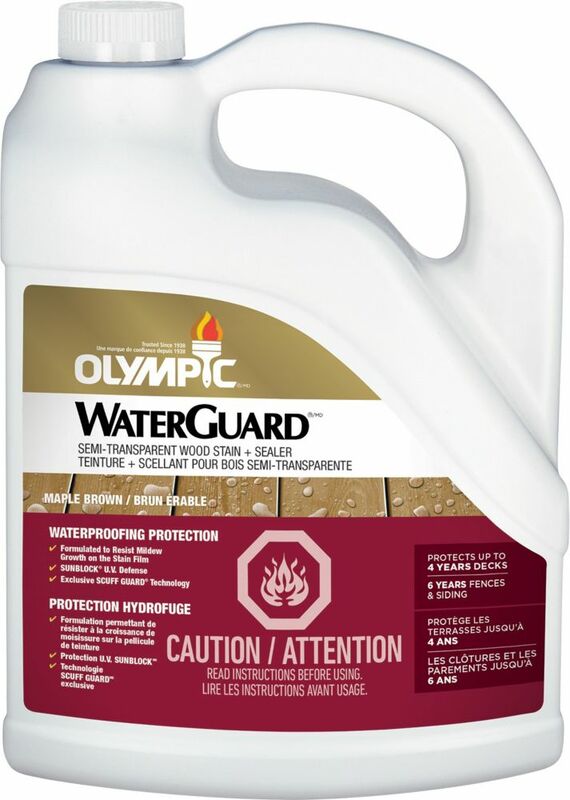 Oly WG S-T S+S M Brown 3.78L-55176C OLYMPIC WATERGUARD Semi-Transparent Wood Stain + Sealer has been specially designed to provide complete outdoor protection for your wood. A rich colour allows the natural wood grain and texture to show for an enhanced beauty. Ideal for deck, fences, outdoor furniture, railings and siding. Available in 3 ready-mix colours. One coat is sufficient for maximum protection.